I’ve been staring at this recipe on Pinterest for awhile now. Are you all Pinterest yet? Talk about a total time buster, I can pop on for “just a minute” and realize 30 minutes have passed. But, if you need inspiration, it’s the place to go! You can follow me there too. But back to the fudge. Last year around Easter I saw THIS recipe. To make Cadbury Eggs. Oh how I love Cadbury Eggs. I usually buy myself ONE egg as a treat each holiday. But now? Now I can make my own Cadbury Egg fudge and indulge all I want (not going to help my swimsuit cause)! Doesn’t it look divine? I only added some vanilla to the recipe, but otherwise kept it the same. It’s a keeper! In mixer, beat the butter and corn syrup together. Add vanilla, powdered sugar, salt and milk. Beat until smooth. Remove 2/3 of mixture to separate bowl, beat in several drops of yellow food coloring to remaining mixture. Line a 9inch square baking dish with parchment paper. Melt chocolate according to package directions. Pour half of chocolate in pan to cover the bottom of dish. Spread white layer over chocolate. Drop yellow layer over the white layer, spreading gently with a knife. Pour remaining melted chocolate over, spreading evenly. Refrigerate until chocolate hardens, about 30 minutes. Using a VERY hot knife, cut into squares, store in covered container in refrigerator. Enjoy! It looks fantastic – just perfect for Easter! I adore Cadbury’s Creme Eggs, so I’m sure I’ll love this. Pinned! Yes, please!! This looks fabulous! My husband LOVES cadbury eggs! It’s probably safer to buy one at a time, I’m sure he’d eat a whole pan of this! ohhhh! I saw this! I’ve been dying to make it, but my husband keeps saying it looks gross… which means it would just be me eating it. And that didn’t seem wise…. It looks wonderful, and I’d be happy for a treat like that anytime!! I think I just tried to bite my computer screen! I love Cadbury’s Creme Eggs, this would be bad for me to have in the house. I wouldn’t share! I love this!!! Very seasonal! *Speechless* … and that doesn’t come often. This is beautiful! O.M.G. I can see why you you kept looking at this on Pintrest! It looks yummy, sweet and chocolaty!! Yum!! That looks so cool! I love all the ideas on Pinterest. Oh my goodness, that is one of the most creative recipes I’ve ever seen! Love some Cadbury eggs! Would love to have you link up to my Recipe Roundup- my fave recipe each week gets a month of free sidebar advertising! 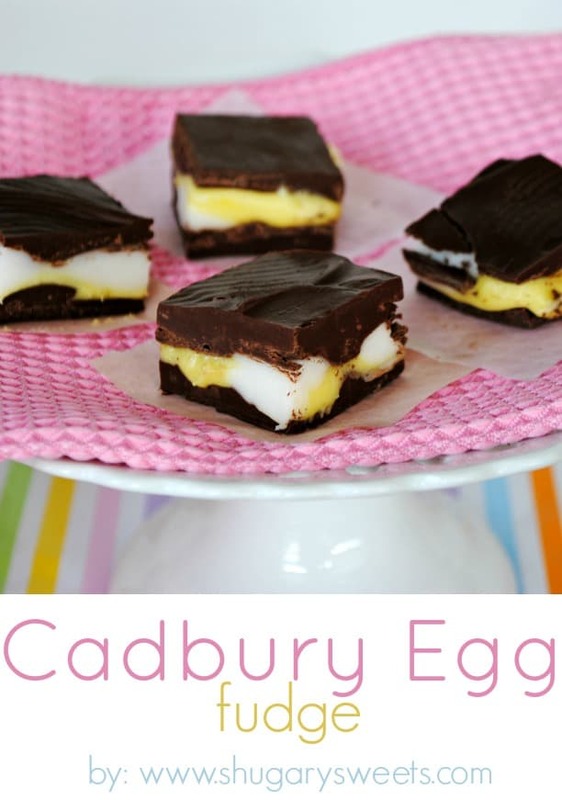 I loove Cadbury creme eggs, what a glorious fudge idea! Was a bit skeptical but really wanted to try this recipe so I made a 1/2 batch yesterday. Delicious! Haven’t had any Cadbury Eggs yet this year but from what I remember – this is soooooo close. My son actually thought I bought a bunch of Cadbury eggs and squished them into a pan. My only suggestion would be to cut them into bite-size pieces before the chocolate completely hardens. 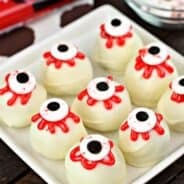 I didn’t do this and after a couple hours in the fridge, when we tried cutting them, the chocolate broke into irregular shapes and didn’t look as pretty as the photos. Thanks so much for sharing this recipe. We’ve really enjoyed it! My guys love Cadbury Eggs — I wonder if they would like this? I’m so glad you enjoyed them! Great tip on cutting the chocolate into bite sized pieces before hardening! Thanks! Such a great easter idea! I’m so loving this! I was devastated last year when Hershey’s started putting the peanut/nut allergen warning on Cadbury eggs since I’m severely allergic to peanuts. Now I’ll just have to make this lovely treat instead! I am SO glad that you posted these! 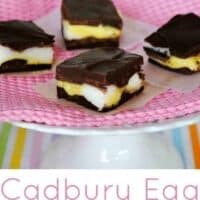 Cadbury Creme eggs are my husbands favorite and I’m sure he will love these!! Thank you! Love that the list of ingredients are easy to find. Nothing worse than having to driving to several stores just to make one recipe. GOOD JOB!!! Looks VERY tasty! OH! MY! GOSH!!!! YUM! I’m dying over these right now. Hi Aimee…i am so happy to have stumbled upon your website..thank God for google plus!! 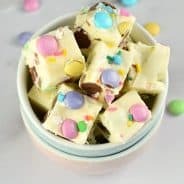 I am definitely going to be making these for Easter! 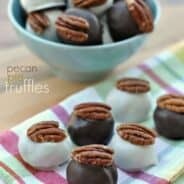 They look so yum and am sure are easy breezy to make. Please do check out my website when u get a chance. It’s not as fancy as yours but I hope u like it! Happy to be a follower. You can follow me to if you like my recipes! I followed the recipe exactly as is. After leaving fudge cool in the fridge for half an hour I go to cut it into sqaures for dessert. The chocolate was to hard it just cracked with any pressure from a knife & the gooey middle oozed out. I ended up with a huge mess. It did taste true to a Cadbury creme egg but, it definintly did not look like the picture. Hi Desiree, running your knife under warm water (then drying it) right before cutting helps make smooth cuts through chocolate. The center definitely is softer than the outer shell, but it shouldn’t ooze out making a mess, more like…softly squish out, hehe! You can also try cutting the chocolate before it completely hardens if that helps. Making these in a silicone brownie bite pan is another alternative. Hope this helps! I had the same problem cutting them, the chocolate cracked all over the place and the filling oozed out. What a mess! Do you spray the brownie bite pan? I don’t spray my brownie bite pan, it’s silicone, so once they are set up, they pop right out! Thanks for the recipe. It looks yummy. I am definitely going to try this. When I start getting really desperate for Cadberry eggs in a few months, this will be ideal. I bet these would work perfectly made as individual treats in paper cupcake liners – no need to cut!